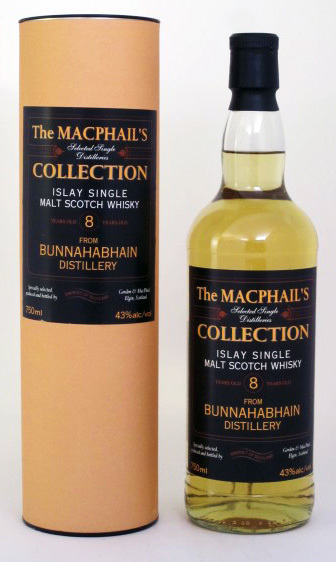 The Macphail's Collection Bunnahabhain 8yo (43.0%): The Macphail's Collection is the affordable range of the famous independent bottler Gordon & Macphail which got the "Best Buy Whisk(e)y of the Year" award from Whisky Advocate (which was known as Malt Advocate back then) in 2010. Under this label they release relatively younger but quite tasty expressions from distilleries of different regions with a price tag under $40. This bottle is filled with spirit coming from one of my favorite distilleries: Bunnahabhain. There are no detailed info on the label or on the tube except it's age but I learned that the whisky is aged in refill sherry casks. To be honest after tasting a surprisingly very impressive three year old expression of Bunnahabhain at a spirit shop in Dijon, France last year I am pretty excited to sample this youngster. Color: Pinot Grigio. Very pale hay. Nose: Unripe pears. Feels like nosing the empty tin pipe tobacco cans I used to steal from my father when I was a kid. Reminded me also the smell of the spirit rooms of the distilleries. And a little bit of sea spray on your face at the beach on a drizzly and windy winter day. Adding a few drop of water makes it completely grassy. A feast of wild greens like dandelion, stinging nettle and watercress. Palate: Baked pie crust and tobacco. Feels way younger and vibrant. It must be the second fill sherry cask. New make taste underneath but strangely enough in a very pleasing and exciting way. I also got young and rough grape brandy notes, most like an Armagnac. Finish: Stinging spiciness, black pepper and wood notes. It leaves with a sizzling feel on the tongue. Almost like the unmalted barley notes from an Irish Whiskey. Overall: It is a punchy, young, arrogant and macho dram. I don't think that it is very suitable for beginners. You have to have an experienced palate, be adventurous and open to surprises. To be honest, I liked it... Exactly what I am looking for from an independent bottler and needless to say it is a steal for this price/value ratio. I have to admit that it won't be your everyday dram at a relaxing night at home but a great dram in your flask for a cold day hike. Gordon & MacPhail put out a Tamdhu 8yrs under the MacPhail's collection that was excellent. To date, I have not been disappointed by anything put out by this independent bottler.